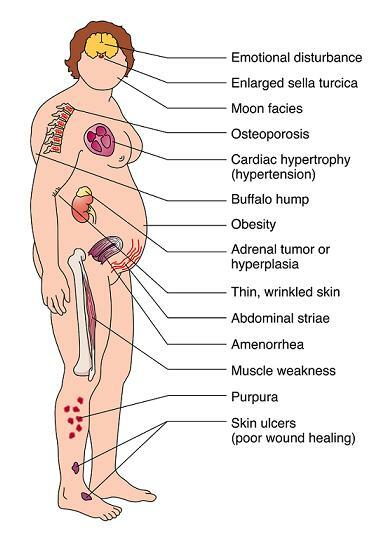 If you think you are suffering from Cushing's disease, then you should start researching more about this particular human disorder. It would be easier to determine whether you have really developed this disease or not once you have learned important things about this hormonal condition. Once you have become familiar with its symptoms and causes, you could easily determine whether you already need medical assistance for curing the Cushing’s syndrome that you have developed. This article explains some of the most important information about this disease. It tries to explain some of the common causes and symptoms of this hormonal condition. It also provides some of the most common treatments used for curing people who are suffering from Cushing's disease. According to scientific studies, this disease is normally developed by people whose body tissues are exposed to extremely high levels of cortisol. Cortisol, a natural hormone produced by the human body, is produced by the adrenal cortex as a response to stimulants of stress and anxiety. It also helps in maintaining normal blood pressure levels and healthy cardiovascular functioning. Balancing the effects of insulin production and breaking down glucose are also two of its most important functions. If your body’s cortisol production levels are at normal rates, you would become less susceptible to the development of Cushing’s disease. However, if the regulating switches of your hypothalamus and pituitary glands start showing signs of dysfunction, your cortisol levels would also increase and make you more susceptible to Cushing’s syndrome. Common symptoms and signs of this disease include upper body obesity, increased presence of fat in the neck area and disproportionately slender arms and legs. It could also cause the human skin to become more fragile, hence making it easy for the body to develop bruises and make it harder for it to recover from such bruises. Stretch marks in shades of pink or purple could also appear in the abdominal area, thighs, arms, and breasts of a person suffering from Cushing’s disease. The body’s bones are also affected upon the development of this syndrome. Victims of Cushing’s syndrome usually report weaker bones, hence making activities such as lifting things or bending over harder for them. These minor activities could easily cause sufferers continuous episodes of back pains or even fractures in their spinal columns. Since people who have developed this disease have weaker muscles and bones, they usually experience severe fatigue, even in the slightest amounts of physical activities. Treatments for people suffering from this disease usually depend on the reason why they have developed higher levels of cortisol in their bodies. Some of the usual treatments used for this disease include chemotherapy, surgery or drugs that could inhibit cortisol levels. These are the most important information you should learn about this particular disease. Now that you know the common causes, symptoms and treatments used for people who suffer from Cushing’s disease, it would be easier for you to determine if you have this illness and get medical supervision before everything is too late.